Chef Machindra Kasture, who was recently awarded the National Tourism Award for being “Best Chef of India”, on cooking inside the Rashtrapati Bhavan kitchen and Pranab Mukherjee’s love for caviar. 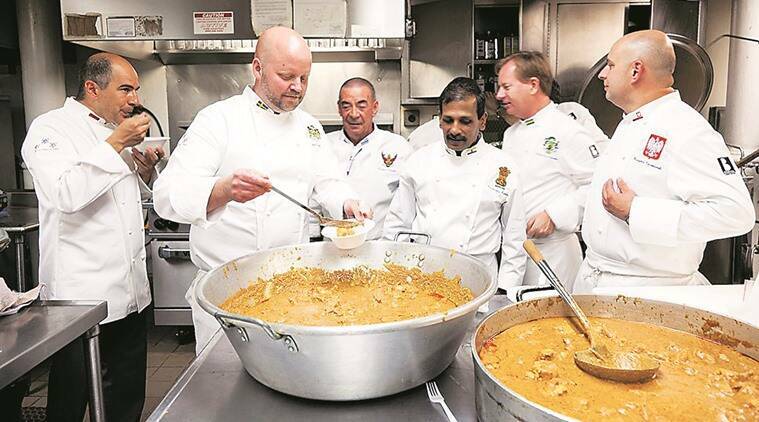 Machindra Kasture (third from right) along with members of Le Club des Chefs des Chefs sampling butter chicken in New York. While residing in Rashtrapati Bhavan, former President Pratibha Patil was quite fond of asking her staff to bring out a bowl of freshly washed raw kundru (ivy gourd) to the dining table and proudly tell guests that the soup they were eating was made from the vegetable and was available nowhere else. Patil suffered from diabetes and the vitamin A and C-rich kundru has long been used to treat high blood sugar. Not in a soup form though. Then there were anjeer ke kofte, another of her favourites, among the innovations introduced to the presidential kitchen by Machindra Kasture, formerly executive chef at the hallowed Rajpath address. “She is a complete vegetarian, but enjoyed her food. I was able to present my own take on dishes, which she appreciated. We made a moong dal pizza without any flour, a pineapple halwa and sitaphal halwa, among other dishes,” says Kasture. Pranab Mukherjee, on the other hand, says Kasture, has a far more carnivorous appetite and has a personal team of chefs, but still relies on Kasture’s expertise for both private and state meals. As the chef to the head of state, Kasture, 53, is a member of Le Club des Chefs des Chefs, an exclusive circle of culinarians employed by leaders from around the world. He has represented Rashtrapati Bhavan when he went to the White House and the UN headquarters in 2013 and has cooked privately for Queen Elizabeth II during a visit to Buckingham Palace. All these achievements were crowned earlier this week, when Kasture won The Best Chef award at the National Tourism Awards, a celebration of the best of Indian hospitality. While he is now posted back at Delhi-based The Ashok (where he began his stint), he still remembers his presidential past with relish. “The busiest days of the year were state banquets and various ceremonies but the real challenge is on days such as August 15 and January 26, when the President organises an “At Home”, which is attended by up to 3,000 significant people from the world. And all this is managed with a permanent staff of around only 10-12 cooks. “They have no technical training, but the cooks there are very good. In most cases, they are the descendants of former Rashtrapati Bhavan cooks,” says Kasture. Growing up in Pune, Kasture would often accompany his mother on her shopping trips to the vegetable and grocery markets. While she enjoyed the pleasure of his company, Kasture picked up valuable lessons in selecting the freshest produce and grains. Later, he also learned to cook from her, sealing his fate like a particularly well-assembled dum. e did the three-year culinary course at the Bombay Catering College and graduated in 1983. He began his career at Centaur hotel in Srinagar, before moving on to the Mumbai property of the same brand. He also began conceptualising new dishes and came to Delhi to run the kitchens of ITDC’s flagship, The Ashok, after he had completed four years on the Royal Caribbean cruise line. After successfully catering a number of important government functions at the hotel, he was invited to don the toque of the executive chef at Rashtrapati Bhavan under the presidency of Pratibha Patil. Kasture planned and executed menus for state banquets, high teas and luncheons at which the President of India hosts his counterparts and other dignitaries. While Kasture can rustle up dishes from around the globe, he serves his own signature dishes, which include Mutton Raan, Kothambir Prawn Rolls and Raisina Dal (whole urad dal), among others. Having cooked twice for Barack Obama, Kasture created a special mutton dish called Raan-e-Ali Shaan at a formal banquet keeping in mind the American President’s fondness for the meat. Another time, President Mukherjee came back from a trip to Sweden and asked him for caviar, which Kasture served with the traditional accompaniments of crackers, separated egg whites and yolks, among others. Post this serving, the President had caviar for lunch for a week. “He loved it,” says Kasture.